Oh, Fall! The wild rose hips are bursting with goodness and adding some crazy bright color to our hillsides! The bright reds and oranges of these juicy little fruits of the wild rose are a harbinger of the winter to come. They also happen to contain tremendous amounts of vitamin C and have been used for ages to boost the immune system! Wild rose hips make a beautiful and tasty red syrup to enjoy medicinally and also for pleasure on your foods and in your drinks! I’m here to share my recipe for this rose hip syrup as well as how to identify and forage for your rose hips. Wild roses grow prolifically around our area, so foraging for them is not really all that hard in our new place here in Idaho. Back in Southern Nevada, we had to make a rather long trek to one of the wild springs in the mountains to find patches of wild roses. If you find wild rose bushes in the spring and early summer where you live, then you can be sure you’ll have wild rose hips to pick later on in the fall and winter of the year! I eagerly await the Fall, when the bright red hips appear! Rose hips are actually the fruit of the rose bush, and they are incredibly useful. There are probably wild roses near where you live too! Luckily, there are over 100 species of wild roses in North America, so surely there are some growing near you! Even in the harshest desert in America, the Mojave, we could find wild roses in the mountains. There are some tricks to foraging and using rose hips, and I’ll go over those here, along with how to make your own rose hip syrup. I’ll also give you some ideas for how to use this delicious and healthy sweetener! Wait! You don’t want to go out and forage for rose hips? No worries! 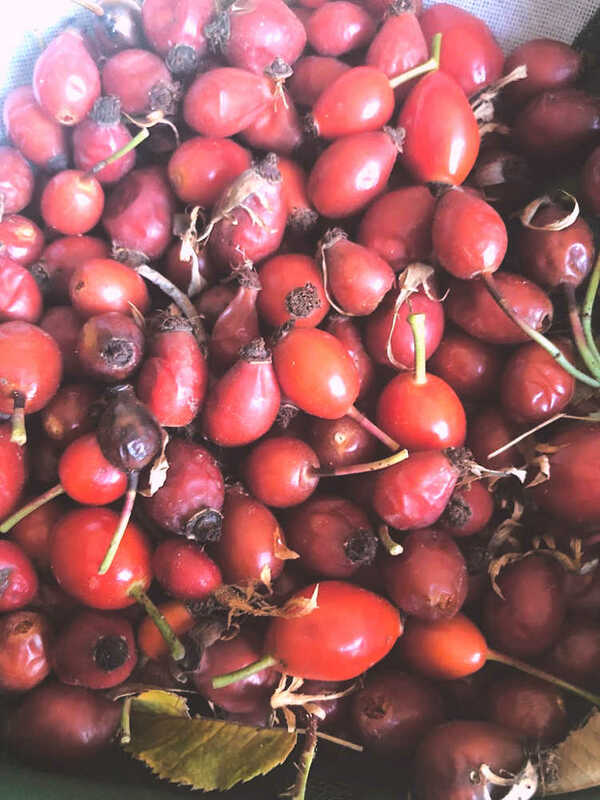 You can purchase quality organic or safely wild harvested rose hips through Starwest Botanicals, an online shop I love that supports things I believe in. They also provide bulk culinary herbs and spices too! NOTE: Would you like to find out how to relax using herbs? My free eBook will help you learn how with lots of recipes and ideas! You can get it at the end of this article! The flowers, flower buds, and fruit (rose hips) of the Rosa species of plants are edible and have been used traditionally in many ways. The flowers are used for calming and soothing tension, and they smell divine as well. The rose hips are incredibly nutritious and good for you, as they contain 20 times more vitamin C by weight than oranges! In fact rose hips contain lycopene, essential fatty acids, an array of vitamins besides the all important “C”, and flavonoids that help the lycopene assimilate into the body. You could say the rose hip is nature’s perfect little vitamin morsel packed into a cheerful little bright red container! Roses have some wonderful properties, being vulnerary, nervine, anti-inflammatory, anti-septic, slightly laxative, and astringent. This makes them excellent for helping with digestion, tension, and soothing minor wounds and burns. In fact the oil pressed from the seeds of rose hips is excellent for using in skin care products. I’ve been using rose hip seed oil on my face for the past month, and I’ve seen a huge difference! Rose hips are so good for you, they were used extensively during WWII to provide enough Vitamin C to children. The flowers range from white to dark pink, have five petals five sepals, and many stamens. The center of the rose flower is a lovely yellow. The leaflets are pinnate and are ovate with serrated edges. The scent of wild roses varies in strength between species, and the stronger scented roses are just amazing! The stems are somewhat woody and have some wicked thorns. Those thorns can making picking the roses and rose hips a challenge, but trust me: It’s worth it! Here is a wild rose flower. If you see these in the spring or early summer, then you know rose hips aren’t far behind! This article is primarily about harvesting rose hips, but the flowers and petals should be mentioned too as this is where the hips are formed. The flowers bloom in June and July in most places. If you want to wild harvest the flowers you’ll need to stay on top of the bloom time in your area. The petals can be dried for later use, or made into teas, infused in vinegars or alcohol for medicinal purposes, used in homemade body products, to create rose water or a hydrosol, and for potpourri. The rose hips emerge as bright red or orange fruits in the Fall. They can be harvested after the first freeze, as the cold temperatures help sweeten them up a bit. You can forage for rose hips for as long as they remain on the bush, often into the dead of the winter months. You can use the rose hips dried or fresh! Keep in mind that if you remove a flower for the petals or bud in the Spring or early summer, you will not get that rose hip in the Fall! You don’t want to completely strip a plant of all the flowers. Here are some of the rose hips that grow on our property. They are profuse up in these Idaho mountains. This is such a lovely Fall syrup to make that will boost your immune system and keep those colds and flu at bay! It’s easy to make, and you don’t need to worry about preparing the rose hips first in my version. **NOTE: Some recipes or preparations require that you remove the inner seeds of rose hips. This is because there are tiny hairs that are irritating to the throat and digestive system that are attached to the seeds. About two or three cups of fresh Rose Hips OR 1 to 1 1/2 cups dried. Fresh rose hips. We’ve had a few freezes, so some are a bit wrinkled. This doesn’t hurt the quality. In fact a good freeze or several makes for less sour rose hips! Step 2) Place your rose hips in a sauce pan, and cover them with water. I’m adding the honey here. This was some raw honey I had that had crystallized. It was perfect for the syrup! Step 3) Simmer for around 20 minutes, mashing them as they soften. You may need to add additional water as the liquid evaporates, and this is fine. Step 4) When you have a nice deep reddish liquid and it’s a little thick, strain off the liquid. 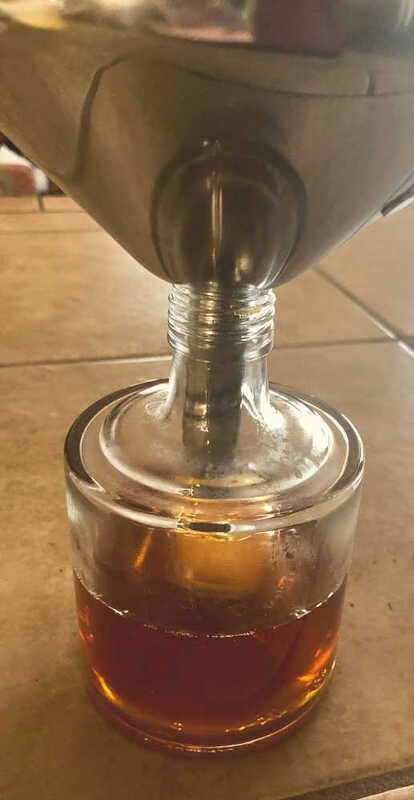 I strain it through a paper towel, coffee filter, or organic cotton to be sure none of the little seed hairs end up in the syrup. Step 5) Add about the same amount of raw honey as the liquid you have and stir well until it is completely dissolved. That’s it! You now have a lovely red rose hip syrup full of vitamin C and nutrients! NOTE: Don’t forget to complete the form at the end of the article for your FREE eBook on Using Herbs to Relax! You may be wondering how to use your rose hip syrup? 1) As a syrup or topping for pancakes, ice cream, or yogurt. 3) You can use it as a base to make rose hip jelly! 9) You can make a wonderful fermented soda! Just follow the directions in this berry soda recipe but substitute rose hips. I’m sure there are hundreds of other uses! Medicinally, take a teaspoon or two a day if you feel like you are coming down with something. Combining it with elderberry oxymel or perhaps some elderberry syrup will boost the actions of the herbs even more! Wouldn’t this be great on some oatmeal or pancakes? Or in a nice cocktail or mocktail? I love herbal syrups, even though I’m not fond of sugary things. It’s a joy to be able to add a healthy sweet to the day if it is infused with the power of herbal goodness like rose hips. What do you think? 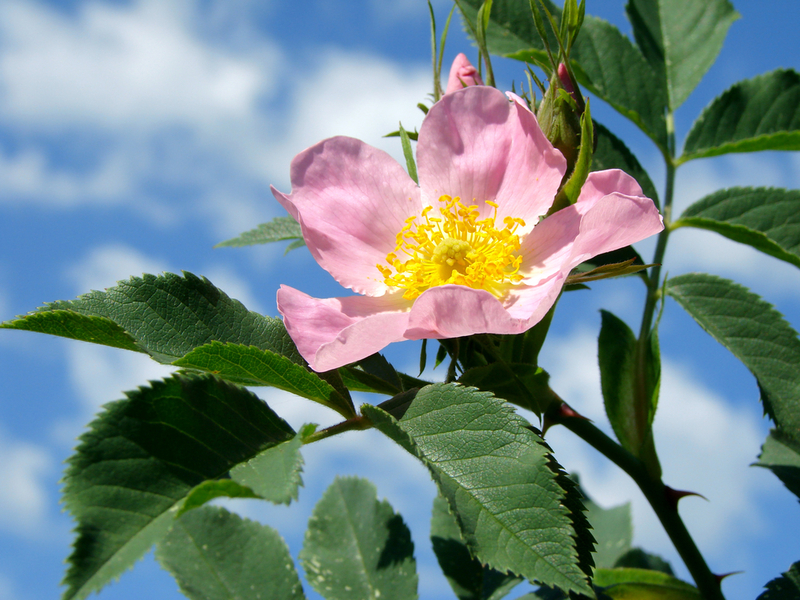 Do you have wild roses growing in your area? It’s Fall, so do some inspecting and see if there aren’t some areas you can do some foraging! It’s a great way to get out in nature and come back with a useful herb to create something with! Leave a comment in the comments section if you have questions or other ideas for this syrup! And there are tons more on the blog, so do some searching using the little magnifying glass in the upper right hand corner (desk top) or the lower right hand corner (mobile). Enjoy! Also—-are you maybe interested in learning more about becoming an herbalist or just being knowledgeable about using herbs for your health? Check out the Herbal Academy of New England. They have courses at all levels and for every herbal interest! P.S. I hope you’ll sign up for the newsletter if you haven’t done so yet! You’ll get access to the FREE Resource Library that contains lots of free downloads, eBooks, guides, checklists, and more! It’s updated weekly, too! You’ll find the eBook, How to Relax Using Herbs in there! The finished syrup is a beautiful reddish color, and it tastes SO good! Disclaimer: I am not a medical doctor, and in no manner, stated or implied, is any wording or opinion in this article meant to treat, cure, diagnose, or prevent any disease. Please be sure to see your doctor before using any herbs or essential oils. These statements have not been evaluated by the FDA.